literature and the changing practices of deity veneration. 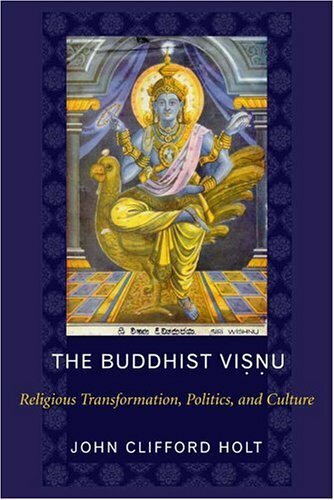 Shifting to the present, Holt describes the efforts of contemporary Buddhist monks in Sri Lanka to discourage the veneration of Visnu, suggesting that many are motivated by a reactionary fear that their culture and society will soon be overrun by the influences and practices of Hindus, Muslims, and Christians. John C. Holt is the William R. Kenan, Jr. Professor of the Humanities in Religion and Asian Studies at Bowdoin College. He is the author of several books, including Buddha in the Crown: Avalokitesvara in the Buddhist Tradition of Sri Lanka, winner of an American Academy of Religion Book Award for Excellence, and The Religious World of Kirti Sri: Buddhism, Art and Politics in Late Medieval Sri Lanka, and is the editor of Constituting Communities: Theravada Buddhism and the Religious Cultures of South and Southeast Asia.